I have long been fascinated by typeface design. I think at least part of my fascination may be an outgrowth of my love of all things related to books and the written word. I love the way books look, and feel, and even smell. And I always consider it an extra treat when there is an explanatory paragraph at the end of a book describing the typeface in which the book was set. Back in college my friend Colin was studying art and design and I was fascinated by the big volumes of typeface collections he checked out of the library. At the time he was heavily into Futura–the same font as all of those letters on Sesame Street. My fascination was with the typeface that was designed especially for the London Undground system. This Futura-like font is unique and recognizable and is used on everthing in the underground from the directional signage to the warnings on the fire extinguishers. When you are on the Tube there is never any doubt which signs are official and which aren’t. The New York Subway system’s committment to Helvetica doesn’t seem quite as unifying as London’s use of the Johnston font. Perhaps it is the ubiquitous nature of Helvetica–it is EVERYWHERE–but I never really thought I was a fan of Helvetica. That is until I watched the documentary Helvetica. 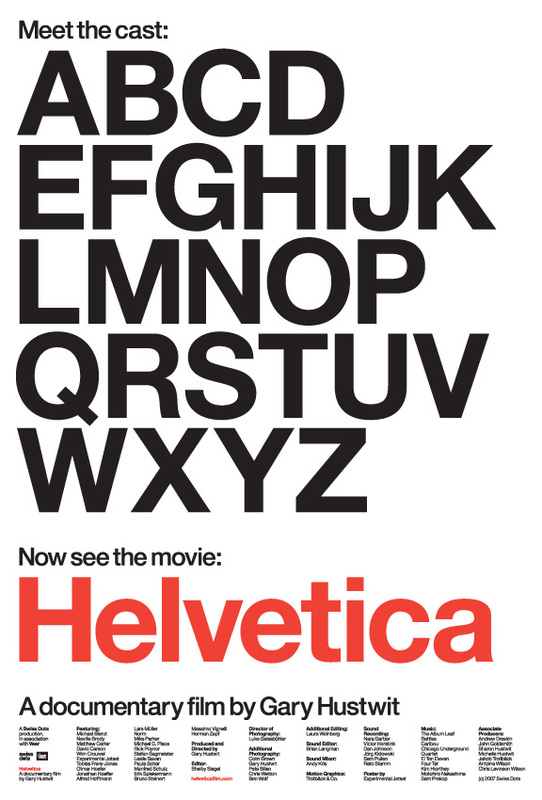 I am not saying I am a total fan of Helvetica (the font) but I am a huge fan of Helvetica (the film). Like most things Modern (with a capital M) Helvetica can be beautiful and perfect when used in the hands of a real talent, and can look really boring and downright bad when used by some second rate hack. The film does a wonderful job exploring the origins and use of the font as well as the Helvetica backlash in the era of postmodern and “grunge” typefaces. For anyone with even a passing interest in graphic design or typefaces Helvetica is a must see. I’ve just added it to my Netflix queue. It will be a nice surprise when it comes.When I’m not feeling totally beat down at The Job, I try to remember to change the font in my documents from the standard Arial that Microsoft uses.If I remember correctly, I chose < HREF="http://en.wikipedia.org/wiki/Bookman_Old_Style" REL="nofollow"> Bookman Old Style <> for my thesis.. According to the film, Arial is just a bad version of Helvetica. A font based on samples of my handwriting would be disastrous! I’ve also requested it from Netflix. You’ve sparked another trend!